The Lion Foundation is a rescue facility for big cats, which is situated on the Hoenderdaell Estate. 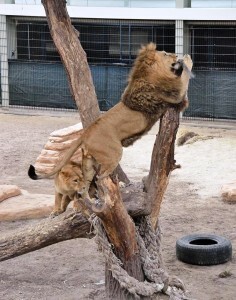 In April 2012 the first big cats were moved to the Lion Foundation. The foundation aims to shelter big cats in need. If at all possible, shelter will be temporary and will prepare the animals for a return to the wild. The rescued cats come for example from private parties or from circuses, which as a result of new legislation are no longer allowed wild animal acts. The owners look for a place where these lions and tigers can live in comfort for the rest of their lives. The Lion Foundation provides such a place. Shelter, rehabilitate and care for feline predators in need. Conduct behavioural research to continually improve the comfort of the animals. Educate visitors on the animals, to teach them how they can help the feline predators. Participate in breeding programmes to contribute to the survival of the species in the wild. Relocate feline predators to their natural habitats.